Why is there a California warning on my SunRidge Farms item? In order to inform our customers, we now label our products sold in California, organic and natural products, with a California Proposition 65 warning. Safety and quality are top priorities for SunRidge Farms. All of SunRidge Farms’ organic products are certified organic and grown with traditional, organic agricultural practices. Many of the elements that triggered this California Prop 65 labeling requirement are naturally occurring minerals and are present in soil around the globe to varying degrees and as such can be absorbed by plants grown in that soil. In addition, the standards for a Prop 65 warning for lead as set by California are specific to the State of California and are not the same as, indeed the limits are lower than, the higher limits for intake content by the World Health Organization (WHO), European Union (EU), Food and Drug Administration (FDA), Canada and the United States Pharmacopeia (USP). Many common foods have trace levels of lead and cadmium, including dairy, meats, grains, fruits, vegetables, nuts, seeds and canned or prepared foods. 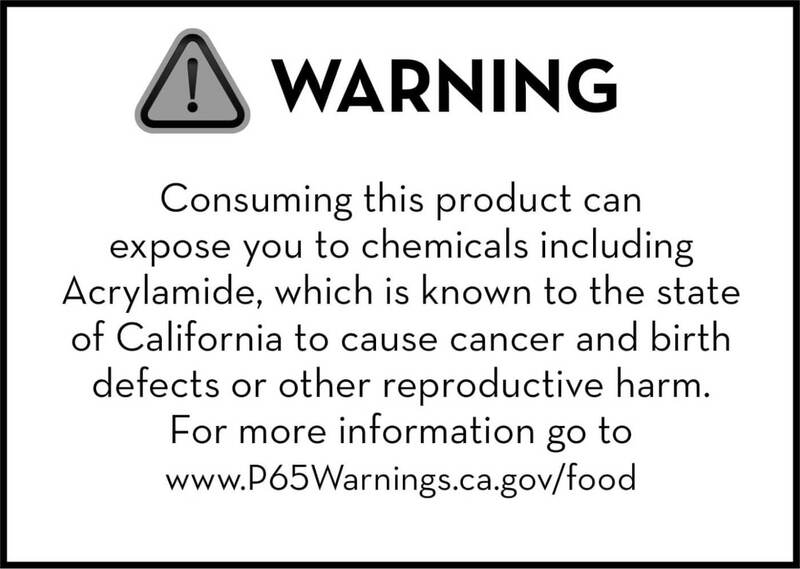 In many instances these common foods exceed the established Prop 65 warning standards. Are SunRidge Farms foods safe? We wish to make it clear that the new Prop 65 requirements have not changed or affected the integrity or composition of any of our SunRidge products. All of our SunRidge products continue to retain the same attention and importance in our approaches to the safety of our community, facility, ingredients and processes as we have for over 35 years. We continue to source the highest quality, nutrient-dense foods from around the world and focus on having the best tools and systems in place to ensure quality, safety and consistency for each of the products we produce. All of SunRidge Farms’ organic products are certified organic and grown with traditional, organic agricultural practices. We’re pleased to demonstrate our commitment to quality and safety by achieving Good Manufacturing Practices (GMP) / Hazard Analysis Critical Control Point (HACCP) and Safe Quality Food (SQF) Level 2 certification for our facility in Royal Oaks, California. HACCP is a scientific process control system for identifying and preventing biological, chemical and physical hazards in the food production and distribution process. We test our products on a regular basis as part of HACCP and SQF Level 2 programs. What is our Pure Food Glaze made from? Why do we choose to use palm oil?